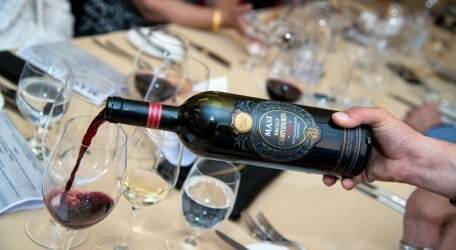 Vini e Capricci – Wines & Whims, which opened last October at the Gozitano Agricultural Village in Xewkija, organised a wine pairing dinner on Friday, 16 May, 2014, for which Masi Agricola Export Manager Carina Kurttila was in attendance. Chef George Borg was tasked with designing a menu to match the five prestigious Masi wines from the extensive Masi Agricola portfolio. This leading Italian Amarone producer is based in Verona but its grapes are grown not only in the Venetian regions but from other prestigious vineyards around Italy and as far afield as Argentina. As the guests gathered, a rosé wine, the Rosa dei Masi, was served as an aperitif in Vini e Capricci’s wine cellar. This rosé is made with Refosco grapes, of which 15% are lightly dried. The wine has a light, intriguing colour and leaves a long after taste that makes it pleasant with different types of foods. For the mise en bouche, a white wine, the Passo Blanco from Masi’s vineyards in Argentina, was chosen to go with a prawn and honey dew melon salad, marinated with an Asian infusion of ginger, soy sauce, chilli and lime, set on grilled vegetables. The Passo Blanco is a blend of 40% Pinot Grigio that is semi-dried and 60% Torontés. This is a fresh, modern, New World wine with tastes of green apple and more complex aromas. Another white wine, the Masianco Pinot Grigio, which is blended with 25% Verduzzo, a local Venetian variety, and matured in wooden casquets, was served with the second course. Its buttery taste with apricot and tropical fruit aromas in mouth went well with a mosaic of grilled chicken and baby vegetables, candied lemon peel and honey dressing. Red wine with pasta? Sure: Brolo Campofiorin Oro, a red wine made of 80% Corvina, 10% Rondinella and 10% Oseleta grapes, accompanied a wonderful plate of deer ravioli, set on marinated mushrooms, accompanied with onion tart tatin and shaved aged pecorino. This Brolo delights the taste buds with its hints of dry fruit and aromas of dark cherries, red berries and blackberries. To pair the dish of stuffed quail with black olives, capers, apricots and walnuts, accompanied by crisp potatoes and rosemary, thyme sauce, another red wine was served, the Riserva di Costasera. This is a blend of 70% Corvina, 15% Rondinella, 10% Oseleta and 5% Molinara, that can age for up to 40 years. This has a long appassimento of 120 days and is a majestic, complex and elegant wine. The appassimento is a production method dating back to the Romans that has been updated to the appaxximento by the current Masi President and Managing Director, Sandro Boscaini, to adapt the winemaking tradition to the XXI century and its new technologies. It involves storing the grapes in bamboo trays in lofts to allow them to concentrate colour and aroma. This memorable meal ended with a dessert wine, Angelorum, a Recioto from the Valpolicella Classica region. It is again a blend of Corvina, Rondinella and Molinara grapes, and was served alongside an apple tart in a hazelnut crust set on roasted fruit and drizzled with gorgonzola sauce. Vini e Capricci is currently hosting an exhibition consisted of 20 watercolour paintings by George Apap. Born and brought up in a family of painters, Apap has the art coursing in his veins. Every Sunday afternoon in his childhood was devoted to a friendly, familial painting competition to see who would create the best landscape or portrait. Having exhibited on a number of occasions in different venues, including St James Cavalier, the Auberge d’Italie and the Gozo Ministry, Apap has chosen for this occasion to work with watercolour. The topics of his eighth personal work deal with many aspects of Malta’s rural landscape and urban character, from the well trodden streets of Mdina to the rugged rocks of Għasri valley. “I never cease to be fascinated by our beautiful islands, the way they change with the seasons, springing back to life with the first heavy rains and sinking into a sun-baked slumber of earthy colours throughout our hot summers,” George Apap said. Officially opened on Friday, 30 May, 2014, by Mgr Joe Vella Gauci, Ambassador and Permanent Delegate of Malta to UNESCO, the exhibition, titled Akwarelli, is running until 30 June from 9 a.m. to 6 p.m. from Monday to Saturday. For this special opening, Donatella Cinelli Colombini’s wines from Tuscany were served. Born into a family of producers of Brunello di Montalcino, and after working for 14 years in the family winery, she created her own estate, made up of Fattoria del Colle in Trequanda – where Chianti and Doc Orcia wines are produced – and Casato Prime Donne in Montalcino, next to Siena, where the famous Brunello is made. While talking about Italy, Vini e Capricci is organising a Sella & Mosca Wine Pairing Dinner on Friday, 27 June, 2014 at its premises. Sella & Mosca is a one of the largest Italian vineyards, located in north-west Sardinia for more than a century. It produces premium wines made exclusively from estate-grown grapes, such as Vermentino, Torbato and Cannonau, but also was among the first to introduce international grape varieties like Cabernet Sauvignon. This website marks a new beginning in yet another medium as I take up a fresh challenge as a freelance writer and editor. I hope you enjoy my interviews, my social and political commentary and my features – now published online.